Today, I’m thankful for the Music. Not just any old music, but THE music. You know what I mean. The music that you can identify after hearing only a few notes. The music that makes your heart flutter; lulls you through the valleys of life; pushes you to the peaks and morphs you there whenever the melody floats into your consciousness. My Dad and Mom did a phenomenal job of making sure I received a well-rounded musical education. Dad LOVED music. He played, listened, sang and studied. Sometimes I thought my Dad’s relationship with music was scientific. I know that’s just what he let me see. There’s a photograph of my Dad that has, for most of its existence, lived in the bottom of a Winchester ammo box. The setting appears to be a swanky red velvet stage. There is a man in the foreground with long hair sweeping down over his face past his collar bones. He has on cream-colored, flared pants and appears to be engrossed in an other-worldly experience with the guitar hanging from his shoulder. That’s my Dad. That photograph reminds me that my Dad’s relationship with music was anything but scientific. My Mom did a lot of appreciating. Her relationship with music looks nothing like my Dad’s, but is no less intense. There was a time, after the divorces of both my mom and my Aunt Judi, where they joined forces and lived together. This meant that I had two moms and a sister (my cousin Abby). All those mornings driving to Nanny’s house, our daycare, were spent singing along to Richard Marx, REO Speedwagon or Journey while listening to WINK 94.1. During the holiday season, Mom and Judi would sing, at the top of their lungs, O Holy Night. Even now, when I hear that song, I’m drawn back to those fun, silly, care-free times and I smile. I can’t watch White Christmas without thinking fondly of that day. Quietly sitting with Abby, convincing her we were getting away with something by not going to sleep, listening to our Moms make a deep-rooted connection through music that would bring years of smiles to all our faces. When looking over my running playlist, I noticed that there is no arbitrary music there. There aren’t any random, up-beat fillers to get me from one inspiration to another. They all have real meaning for me. A little Muse always get’s the heart pumping. Especially a song possessing lyrics to revitalize an internal pride for an institution rocked by scandal that brought personal scrutiny from people, once considered, close friends. Anonymous photographer’s photo is worth 15,000 words. The tunes from We Found a Love and Dynamite always keep the blood pumping and the feet pounding the pavement. 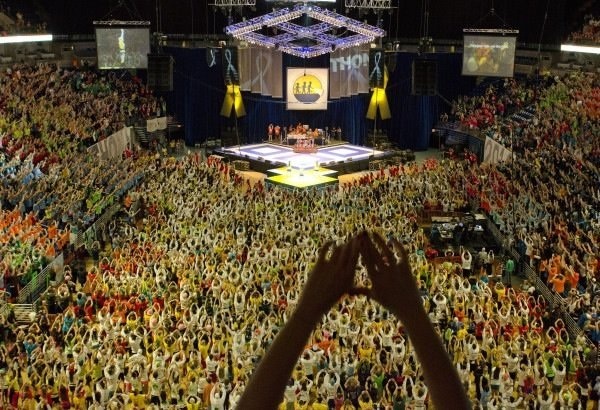 Anyone who’s been to THON and watched 15,000 plus people raise their hands into the air in the shape of a diamond understands the flutters through your stomach these songs can evoke. Then, a little Van Morrison to cool things down. This would have been the song I would have danced with my Dad to at my wedding. During each run, the past, present and future come along. This music, the soundtrack of my life, establishes a common thread that connects all elements to create a sparkling garland of memories. I’m reminded of the best of my world and inspired to keep going one note at a time. I love that music can bring back so many vivid emotions. Not all of the images are happy, but that is life.